Hello all, hope you're having a wonderful day! Today I wanted to share with you how I've done my nails for my 5th anniversary which is tomorrow. My dress is a turquoise- green shift dress which I thought would be perfect for a summer celebration (mind the weather) so I've chosen hot pink nails for a colourful clash! I've used my regular ELF clear polish as a base coat and followed that up with OPI's Muppets collection polish in Meep Meep Meep! As much as it pains me to say; this is a limited edition so I'm not sure if it can still be purchased :-(, so if you guys know any good dupes I'm all ears! It doesn't end there though... As it is a rather special milestone in my relationship I thought I'd try and jazz my manicure up a bit... 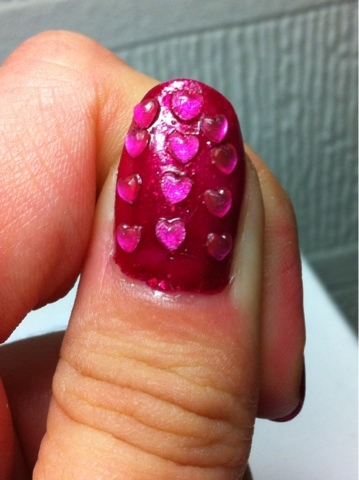 Enter heart shaped rhinestones. Just a heads up, Ebay is a great place to find cheap nail art bits and bats. 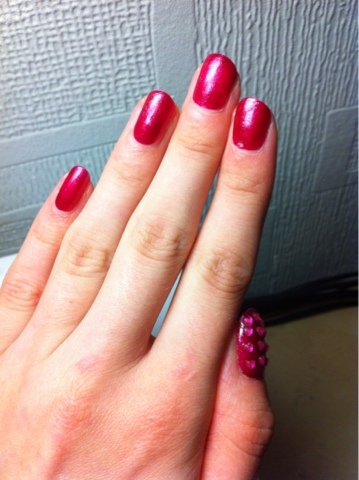 The rhinestones I used cost me 99p with free shipping! Amazing. For that price I received a wheel of roughly 1200 heart shaped rhinestones in 12 different colours (black, silver, turquoise, royal blue, red, baby pink, fuschia, lilac, royal purple, golden/orange, mint green and emerald) and they're all so pretty. 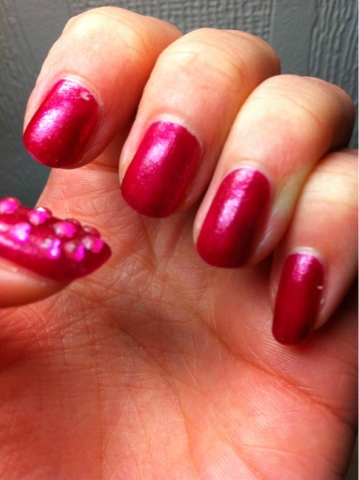 To apply them I just used a cuticle pusher with some base coat on to pick up the gems and then placed them on the nail while the polish was still tacky (to avoid smudging the actual colour I'd advise applying a thick layer of base coat rather than applying the stones onto tacky colour). Here's the finished result... The gems aren't perfect but it was a good first attempt. Hope you like!